For a more guided introduction to working with lattice light sheet data on the CBMF server, see the post-processing workflow tutorial. Why is it necessary to deskew lattice light sheet data? The fact that the detection objective lens is tilted at an angle with respect to the axis of stage movement results in an unconventional geometry for the acquired image stack. 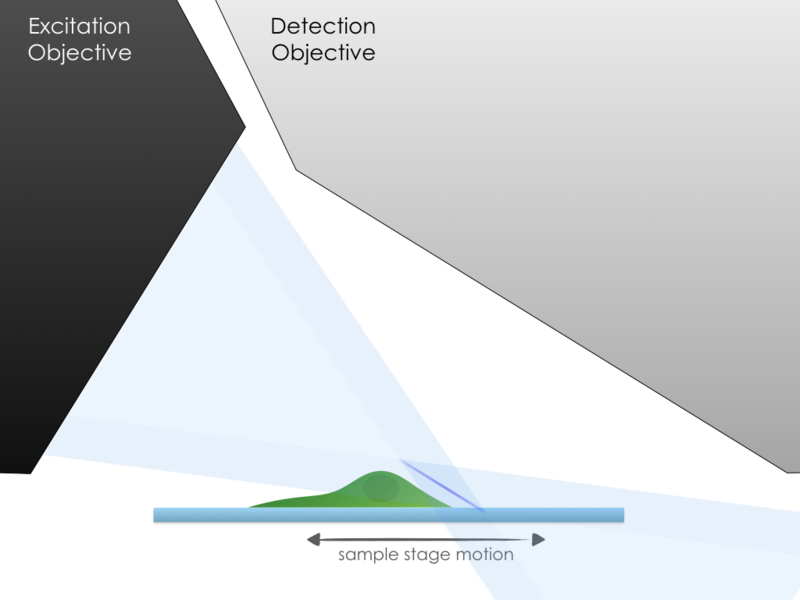 The following video attempts to explain the need for post-processing (deskewing) of data acquired in stage-scanning mode on the lattice light sheet microscope. The video below from the Betzig group is also useful for visualizing the three-dimensional geometry of the sample (gray) as it moves through the light sheet plane (blue). The red/orange highlighted part of the sample is the optically sectioned image at each position. Using the llsinfo over an ssh connection, you can also preview lattice light sheet data remotely. This is useful when you want to verify the data contained in an LLS folder, perhaps before downloading/processing, etc… You can view either the MIP file, or the Z stack for a specific channel/timepoint. Log in to the CBMF server using X11 forwarding. Use the --showmip or -s flags with the llsinfo command to get a preview of the maximum-intensity-projection (assuming a MIP exists). A window should appear on your local computer with a preview of the dataset. You can click and drag on the sliders at the bottom to change the channel, or the timepoint. Note: this function can usually be used to preview the MIP file for data that has been compressed for long term storage. A window should appear on your local computer with a preview of the dataset (or an alert may appear saying the file cannot be found). You can click and drag on the slider at the bottom to change the z position. There are multiple way to transfer files from the CBMF server. Note all of these methods require being on the HMS local network, or using a VPN to connect to the HMS network. Note: Connecting to the server using any of these methods in requires that you have an account on the CBMF server. If it is your first time connecting and you are unable to connect using the instructions below, try first connecting to cbmf-nas.med.harvard.edu with your ecommons credentials using the instructions here. If you are still unable to log in, contact us. Choose Start > Run from the Desktop taskbar. Enter your eCommons user name and password when prompted and hit enter. By default, data acquired on the lattice is saved as individual Z-stack TIFF files for each timepoint, for each channel. Viewing an entire 5D dataset can be very challenging, and demands a computer with enough RAM to hold the full dataset (or the use of virtual stacks, which have drawbacks). We strongly encourage contacting IDAC for assistance with visualization and analysis of datasets acquired on the lattice light sheet. If you wish to view the full 5D dataset, the following procedure will arrange the data into a single hyperstack in ImageJ/Fiji. Navigate to the folder containing the data (such as the Deskewed folder in your LLS folder), and click Open. In the Sequence Options window that pops up, you can either just click OK to select the full dataset, or change the options to select a subset of the data. Number of frames can be quickly determined from the number of files that you opened (divided by the number of channels). Number of slices can be determined by opening a single Z stack, or by dividing the number of planes in your combined stack by the number of channels multiplied by the number of frames. channels ｘslices ｘframes must equal the number of planes in the imported combined stack. The resulting 5D Hyperstack is useful for extracting an ROI from a subset of the data in XYZC or T.
Channel 2 demonstrates the residual electron artifact seen in the Hamamatsu ORCA Flash 4.0 in Synchronous Trigger mode (as used on the Lattice Light Sheet Microscope), after deskewing and max projection. We have characterized this phenomenon for our camera and can “correct” this issue, predicting the carryover charge expected in any given pixel in the image as a function of the intensity of that pixel in the immediately preceding image. Hamamatsu ORCA Flash 4.0 residual electron artifact before and after correction. The capital -C flag additionally applies a selective median filter, after Flash pixel correction, styled after Phillip Keller’s code published here. The code for this correction exists for both MATLAB and Python and will be provided on request. Please contact us. many “raw” (pre-processed) TIFF files. See below for the naming convention. a Settings.txt file with metadata about acquisition settings. a Deskewed folder that contains the deskewed data. a GPUdecon or CPPdecon folder that contains any deconvolved data. This directory may not include full deconvolved Z-stacks depending post-processing parameters, but will likely include a max intensity projection “MIP” file for all channels & time points for easy viewing (scroll to the bottom of the folder), the MIP files may also be separated inside a MIP folder. To retain or retrieve the complete deconvolved data during processing, see here. To combine separate timepoint and/or channel stacks/MIPS into a single 4-5D hyperstack, see here. If you are not going to analyze the deskewed data anytime soon, we recommend deleting the deskewed/deconvolved data and compressing just the raw data (i.e. “deep freeze”). bzip2 compression is used by default, but this can be changed in the options. By default, the lls command will generate a Deskewed folder that contains the complete deskewed data and a GPUdecon folder with a single file that contains the combined maximum-intensity projections for all time points and all channels that can be easily opened in ImageJ/Fiji to view the dataset. But the complete deconvolved Z-stacks will not be retained, in order to minimize unnecessary data size inflation. You must either be on the HMS network, or use a VPN client to log in to the HMS network if you are off campus. Note: Logging in requires that you have an account on the CBMF workstation (“latwork”). If you are unable to login at cbmf-latwork.med.harvard.edu following the instructions below, try first logging in to cbmf-nas.med.harvard.edu with your ecommons credentials to create an account, then logging out (type exit), then logging in to cbmf-latwork.med.harvard.edu. Contact us if you are still unable to log in. Once the connection is open you should see a prompt asking for username and password. Use your ecommons credentials to connect. If you’d like to use the llsinfo --show command to preview data remotely, you will need to log in using X11 forwarding.